2013 has been a momentous year! December 2012 marked the conclusion of an evolutionary cycle of approximately 26,000 years. 2013 has been a year in which we have seen much chaos pouring forth, just as the pus must flow forth from a boil in order to allow healing to take place. Our planet is preparing for newness of life within a Golden Age. In order to understand what is truly taking place, we must recognize that heretofore our concept of the world has been extremely limited. Our worldview has consisted of a miniscule portion of Mother/Father God’s immense and on-going Creation. Our concept of God has been much too small. Now, it is time to open our minds and hearts to an expanded knowledge of God and all of Creation. Scientists have found that humanity uses only about 10% of our brain power and that we are consciously aware of about 2% of what is actually present within Creation. In addition, only 2 strands of our DNA are activated, with the remaining strands being called junk DNA. Humanity is accustomed to functioning at a very low level of our true potential as beings created in the image of God. We have now reached the stage at which the remaining strands of our DNA are being activated. We are on the verge of taking a huge leap forward in our conscious awareness and use of our Higher Mind—the Intuitive Mind that has a direct link to the Mind of God. We will have access to all knowledge through our Intuitive Mind. Telepathy is to be our means of communication, eliminating all the confusion that “words” inevitably cause. Previously, we have been content to listen to the authorities and accept what they told us as the truth. As we grow in conscious awareness, we are beginning to sense that things are not as we have been taught. Mother/Father God’s creation is far, far, far beyond what the authorities have told us. So far beyond what using only 10% of our brain power can comprehend that as 2013 comes to a close and we enter 2014, our minds will be blown. Because we have so much to learn, it will be most beneficial to us if we do not cling to the past or to the old beliefs about our world. The New Earth—with our help—will be returned to its original pristine Garden of Eden state. The New Heaven will be glorious beyond our capacity to imagine. Let’s take a glimpse of some of what we are about to learn regarding Earth and Heaven. Physics students are taught “Everything is energy moving at varying rates of speed.” But because our worldview has been so small, we tend not to take this truth to its ultimate conclusion—energy can be vibrating so rapidly that our physical vision cannot perceive it … thus the fact that we see only about 2% of what is around us. Think in terms of an electric fan. We can see the spokes when they are vibrating at slow speed. Turn the fan to high speed and we can no longer see the spokes. But we feel the spokes turning at high speed. We can even see the circle of energy caused by the spokes moving at high speed. However, let’s pretend we cannot see the fan itself … would we recognize the circle of energy that we can see and feel as what it is? Much of the New Earth and the New Heaven vibrates at such a high speed that only a relatively few can presently see or feel it. Those who have achieved a level of conscious awareness that allows them to perceive the higher dimensions of reality often share what they behold with those who are open and willing to listen. They tell us of a vast cosmos filled with life. Planets are living beings with a soul. Gaia is the soul name of Earth. Millions of planets are inhabited—many with humanoid beings; many with other forms of intelligent beings. We call these beings our Galactic Family because we, too, are Star beings. Many of our Star Brothers and Sisters are extremely advanced—millions of years ahead of Earth Humans—intellectually, spiritually, and technologically. Still, we, as Earth Humans, are a vital part of the entire cosmic family—all live and move and have our being within the energy of Mother/Father God’s unconditional love. You and I are One (United) with All That Is. This fact has simply been hidden from us for thousands of years. Mother/Father God is Love and nothing but UNCONDITIONAL LOVE far beyond our ability to comprehend. This level of unconditional Love cannot judge, punish, or condone violence of any type. Divine, Unconditional Love beholds only Love! Earlier, I mentioned the higher dimensions. The old, familiar Earth vibrated at a 3rd dimensional rate of speed—comparable to the low speed of an electric fan. While living on the 3rd dimension, we have experienced good and evil, as related in the biblical story of Adam and Eve eating the apple from the tree of knowledge of good and evil. However, the Divine Plan for Earth and for the entire Cosmos of planets and intelligent beings is that we evolve in our conscious awareness to ever-higher dimensions. In December 2012, Gaia (the soul of Earth) managed to break loose from the 3rd dimension and entrench her roots within the 5th dimension, where no suffering can take place and all live within the energy of Love. During the year of 2013, Earth has given its human inhabitants the opportunity to become aware of higher levels of Love and to learn to be expressions of that Love. For that reason, we are seeing tremendous upheaval as the negativity foisted upon Earth by human actions to the point of almost destroying our planet flows forth in the form of earthquakes, volcanoes, hurricanes, and other severe weather conditions. Earth is cleansing itself in preparation to ascend to a dimension of Unconditional Love. Likewise, Earth humans are feeling intense energies urging them forward in their conscious evolution. Sadly, many do not understand and react violently. 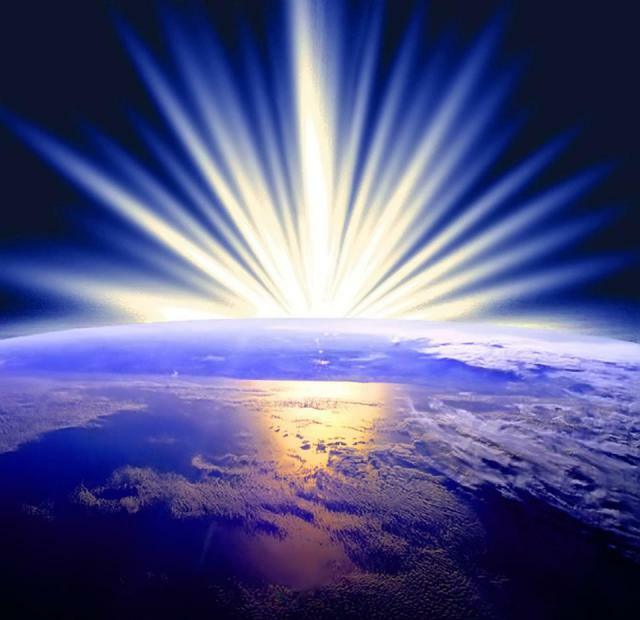 The Divine Plan is that all violence will cease as the Love energy grows ever more intense on our planet. Love is the most powerful force in the Cosmos! You may have noticed this difference in energy … people are waking up to the truth that they want no more war, no more bullying, no more violence. Instead they are creating avenues for expressing love for each other. Unconditional Love is the quality of a Christed Consciousness. As we celebrate the coming of Jesus to show us the Way back to Love, may we open our hearts and minds to an expanded knowledge of Mother/Father God and the magnitude of our ONE FAMILY OF GOD! I wrote this letter to send to relatives/friends who have most likely not heard of how our world is changing … as a means of at least allowing them the opportunity to consider life in a more expanded way in preparation for all the huge changes that are just around the corner. Feel free to share it in any way you like!